(FULLY REFUNDABLE WITH NO DAMAGES) . It has an oversized dock with lots of living space for entertaining, fishing or just relaxing. The home has quartz countertops, wood cabinets, stainless appliances, upgraded bedding, 4 flat screen TV's, cable, Internet/WiFi access, outdoor grill, a large covered/screened lanai and waterfall pool that has a highly desirable sun exposure...the sunrise and sunsets are simply stunning right off the screened back porch or dock. The rental includes 4 adult and 3 kids bikes, 2 kayaks, beach chairs, umbrella, coolers, beach towels, and a rolling cart for beach equipment. The new oversized dock and new seawall provide hours of entertainment to include fishing, viewing dolphins and other sea life swimming by, or for simply enjoying your morning coffee or afternoons waterside under the gorgeous Coconut Palms. The dock also has lay-along, bumpered dockage for up to a 30-foot boat, for shorter-term boat dockage or rental boats... and easy access to the Gulf (only one fixed bridge at 14' height). Sorry, boat lift occupied by owner's boat. LOCATION...LOCATION...LOCATION... It's approximately .6 miles (6/10s) along paved sidewalks and public access to the world renowned beaches famous for their beautiful white sand, tranquil waters and enormous quantity of all types of shells. Bike, walk, or drive...you are less than 5 minutes from Marco's heavenly beaches. And, numerous public access golf courses are within 15 minutes drive of the home. Additionally, nearby Naples offers world class golfing, shopping and dining experiences. The International Airport is only about a 30-40 minute drive. Come and enjoy our cozy piece of paradise TODAY !!! Note: Owner is a Realtor. Ralph Engeler is a licensed Florida Realtor dealing in both East Coast (Fort Lauderdale) and West Coast (Naples-Marco Island) properties. This rental is our privately held vaction home. Marco Island is a fabulous,family-oriented paradise located only 10 minutes from Greater Naples and only 1:15 from Fort Lauderdale. It's upgraded infrastructure and easy access make it a breeze to get to and around and enjoy superb world-class fishing, swimming, boating, biking, golfing, and lots of sunshine. Walk, ride bikes on wide sidewalks or drive the short 1/2 mile to the beautiful beaches or Resident's Beach. Movies, restaurants, shopping are all only about 1 mile away. Newly renovated Guest Bath with quartz/wood vanity, sea shell mirror and glass tile shower surround. Renovated Master Bath with Granite/wood vanity and tiled shower.....GREAT WATER PRESSURE! Located directly on beautiful ocean water canal with direct access to the Gulf. Awesome sunrises and sunsets right off the back porch or dock. Watch the dolphins from the dock. Home has a private washer and dryer. In home has FREE WiFi . Reception is also good for AirCards, and many local establishments nearby also have WiFi, such as Starbucks and Internet Cafe. New Kitchen with Quartz Counters, wood cabinets and newer stainless kitchen appliances....new utensils and dishes. Home has 3 Flat Screen TVs and 1 regular TVs with cable and DVD players. Lawn care is provided by outside vendors. 2 kayaks on site under house. Large screened and covered deck/patio and wrap around deck walk around house. Less than 1/2 mile from public racket club (court fees apply)and Public Park with large kid's climbing/playground and indoor table tennis, pool, covered basketball, and Foosball, etc.. 4 Adult and 3 children's Bicycles included with rental on site at Property. Loved our family vacation at this well-equipped home! 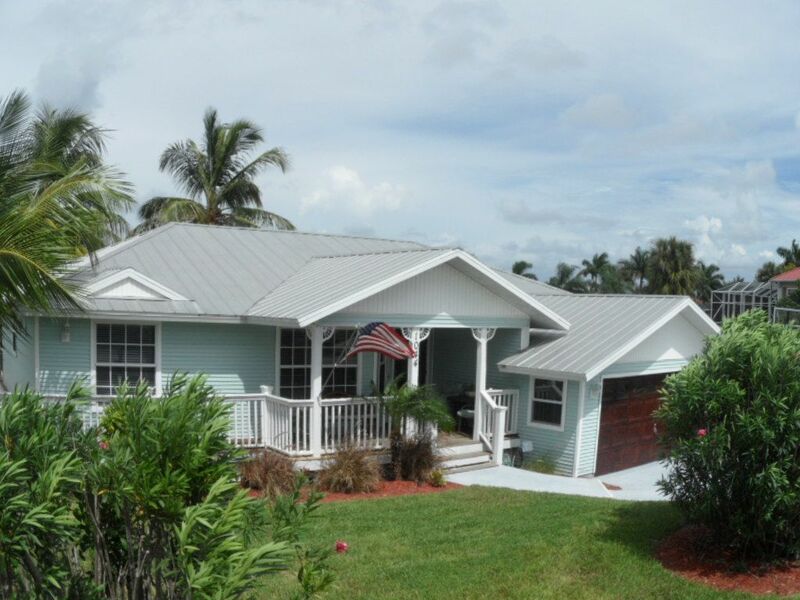 This home was centrally located on Marco Island and very clean. Easy bike ride to many activities, enjoyed fishing off the dock, swam daily in the heated pool, and played many family games together around the large table in the screened porch. Kitchen was fully stocked, ample towels, very comfortable setting. Would definitely stay here again! Thanks guys, glad to have you. Hapoy New Year and come back anytime!! Our stay at the cottage was outstanding if not considering buying for next year we would have rented this again without any hesitation. Very clean, the pool was immaculate and the pool heater was perfect. We spent most of our time on the lanai plenty of room and shaded. The location was also a plus. Very cute, clean and well appointed home. Perfect for a long weekend or extended stay. We rented for three months and had a great time. What i like most about this rental, is everything works. And if something goes bad the owner takes care of it immediately.. You want be dissapountwd. Great accommodations, great location, great vacation. A great little getaway will all amenities included and beyond our expectations, Everything was exactly as mentioned by the owner. Would recommend to anyone wanting to visit one of the best vacation paradises on the west coast of Florida, we will definitely be back next year. Thank you, Sir. It was an honor to have a Veteran such as yourself stay at our home with your family to celebrate the 4th of July! Most relaxing vacation in a loooong time. This home is the most well equipped vacation home I have ever stayed in. Ralph and Linda were Very responsive to any questions we had. The house is so very comfortable. Convenient to any activities on or off the island. It is such a comfortable, homey place, I had to force myself to go out. Any and all equipment you can think of for recreational fun. We give a double thumbs up to this property and recommend giving it a try. My husband and I spent two months at this lovely, well equipped home this past winter. It had all the amenities we could ask for. The location was central to everything and we loved riding bicycles to tennis, the beach, and restaurants. I became attached to and still miss my Hendrix beach bicycle. We enjoyed dinner on the lanai and evening walks around the lake in Mackle Park. We would love to return for another stay. Tenants must post a Pet Deposit of $600 per pet, with an absolute maximum of 2 small-pets, if pre-approved by owner. $500 of the Pet Deposit is refundable, if all is left in good order with no damages. $100 is non-refundable. Carpet cleaning/odor abatement is $150, withheld from pet deposit, only if required. Seasonal Full Pool Heating Option - incurs a weekly $50 or monthly $200 electric surcharge (may be billed on invoice as $8.06 daily fee).